Separated from the Eastern Hill (the Temple Mount and the City of David) by the Kidron Valley, the Mt. of Olives has always been an important feature in Jerusalem’s landscape. From the 3rd millennium B.C. until the present, this 2900-foot hill has served as one of the main burial grounds for the city. The two-mile long ridge has three summits each of which has a tower built on it. 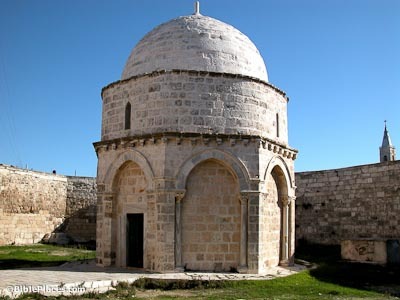 The Church of the Holy Ascension was taken by Saladin in 1187 and converted into a mosque and remains such today. It contains what is traditionally the last footprint of Jesus on earth before he ascended into heaven. Two other places are claimed to be the location of the ascension. Constantine’s mother Helena built a church under the modern Paternoster Church to commemorate this event. A much later tradition connects the Russian Orthodox Church of the Ascension to Christ’s return into heaven. Scripture indicates that the Jesus ascended into heaven in the vicinity of Bethany. This village is down the east slope of the Mt. of Olives about 1.5 miles (2.2 km). In this case, none of the traditional locations for the ascension are correct. 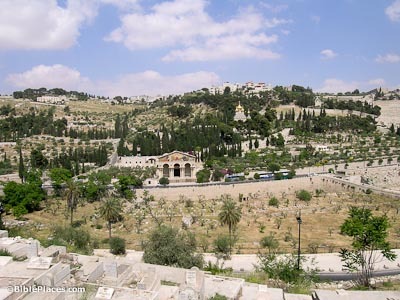 Early Christian pilgrims located the Garden of Gethsemane at the bottom of the slope of the Mount of Olives opposite the Temple Mount. Byzantine, Crusader and a modern church were built successively on the site where it is believed that Jesus prayed to the Father hours before his crucifixion. The modern Church of All Nations has a beautiful mosaic on its facade. Adjacent to the Church of All Nations is an ancient olive garden. Olive trees do not have rings and so their age can not be precisely determined, but scholars estimate their age to anywhere between one and two thousand years old. It is unlikely that these trees were here in the time of Christ because of the report that the Romans cut down all the trees in the area in their siege of Jerusalem in AD 70. This Russian Orthodox church was built in honor of the czar’s mother in 1888 and the mosaic inside depicts the legend of Mary Magdalene presenting an egg to the Emperor Tiberius. The egg allegedly turned red when she handed it to him, symbolic of Jesus’ blood. Approximately 30 nuns from all over the world live in the convent here today. Built in 1955 to commemorate the Lord’s weeping over Jerusalem, Dominus Flevit features a beautiful view of the city through its distinct chapel window. Excavations during construction of the church uncovered a number of ossuaries (bone boxes) from the time of Jesus with numerous inscriptions. 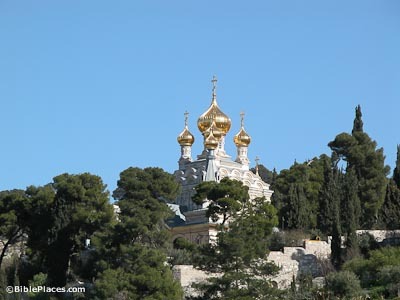 Mount of Olives (Biblewalks.com) Describes many structures, all over the city, that you can see from the Mount of Olives. Includes background information on many of these sites. 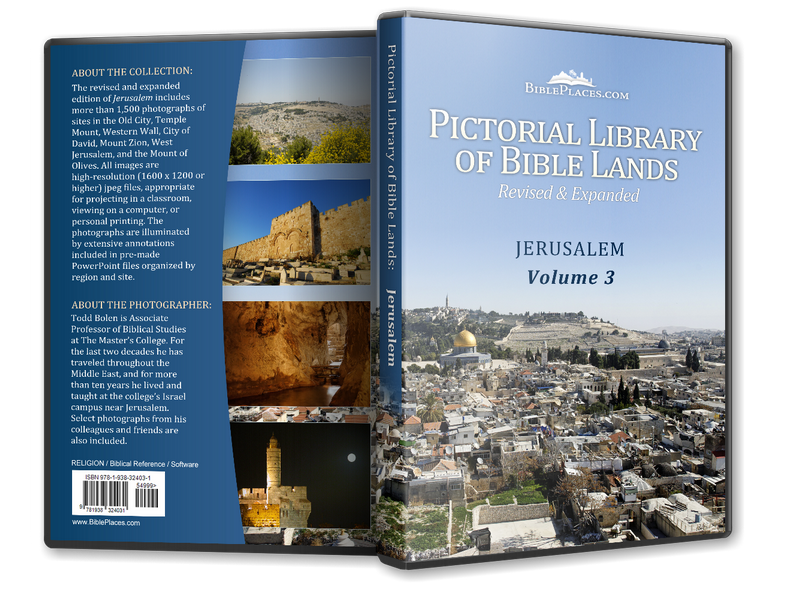 Mount of Olives (Christian Travel Study Program) Highlights the biblical importance Jerusalem’s eastern hills, also briefly describes the many holy sites dedicated to events in Jesus’ life and ministry. Features several good pictures. 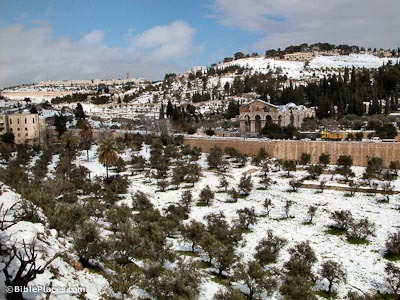 Mount of Olives (WebBible Encyclopedia, ChristianAnswers.Net) Interests the reader with both physically and biblically descriptive facts, including internal links to related topics. The Mount Of Olives (Daily Bible Study) General information about the area with links to many topics related to historical geography, biblical characters, biblical manners and customs, other biblical events, and the life of Christ. Mount Olivet (Catholic Encyclopedia) Discusses the biblical events that occurred in the region. Text only, no photographs. The Mount of Olives – A Symbol of Division (The Open Scroll) A lengthy article about the Mt. of Olives, presenting the mount as a spiritual symbol of separation. 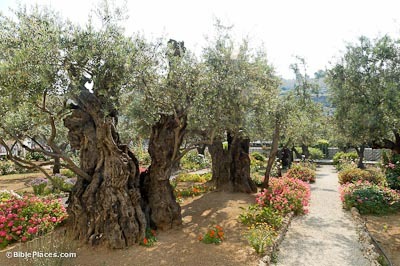 Gethsemane: Separation in the Olive Press Place (The Open Scroll) A follow-up article to The Mount of Olives – A Symbol of Division, also rather lengthy, discussing the name “Gethsemane” as a symbol of Jesus’ experience in the garden. Jerusalem – Beyond the Old City Walls (Virtual Israel Experience) Details the sites commemorating the final hours of Jesus’ life on earth. Contains some factual errors. 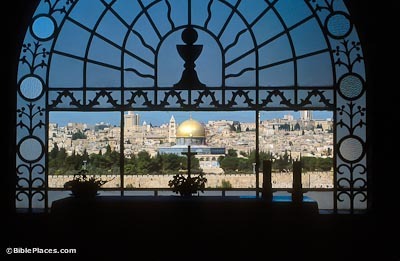 Dominus Flevit (Franciscan Cyberspot) Spotlights the Franciscan church on the Mount of Olives and the excavations that took place there as a result of a boundary change. Mount of Olives (jerusalemiloveyou.com) Limited text, but features two hard-to-capture (therefore unique) photographs of the interiors of two of the churches. Jerusalem from the Mount of Olives (Artchive, oil painting) A beautiful painting, amazingly detailed, depicting the Old City of Jerusalem as seen from the Mount of Olives. Jerusalem Then and Now; Temple Mount from the Mount of Olives (Personal Page) Compares two photographs, one from 1952 and the other from 1990, pointing out the differences between the two. Bethphage (Christian Travel Study Program) Briefly introduces this village on the eastern slope of the Mount of Olives and its biblical role. Bethphage (Daily Bible Study) A review of the events in Jesus’ life at or near Bethphage. Bethany (Walking in Their Sandals) Gives easy-to-read information on the location, biblical significance, etc. Features links to photographs and on-line scripture references. Bethany (Christian Travel Study Program) Highlights this town’s biblical importance and proximity to Jerusalem.